We are a group of people coming together to share stories, support, ideas and laughs! Our members consist of men and women, of all ages... some of us have just been diagnosed with Fibromyalgia and/or Chronic Fatigue Syndrome and some of us have lived with it for 10-20 years... Some of us have been on Disability for many years, some just a few years, some have just started the application process at DES and, of course, there are some of us who were denied access to their Social Security funds. Our Regular Support Group Meeting is on the 2nd Thursday every month from 6:00pm to about 8:30pm. 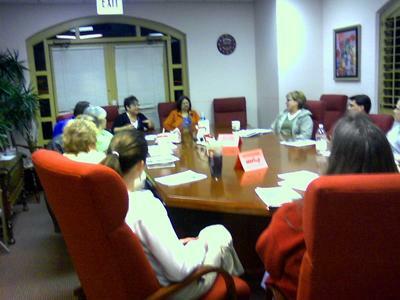 We usually have general discussion or on a certain topic, or we may have guest speakers. We share stories on how life is going, how long we've had Fibromyalgia and what combination of exercise, diet, prescriptions, treatments, supplements, or other alternative medical ideas are working for us. This meeting is in the Conference Room at the Hospice Family Care Offices, located at 1550 S. Alma School Rd. Ste. #102, Mesa Arizona. on the SW corner of Warner Road and Alma School, about 4 miles South of the I-60. Sozo’s is to the left of the 99 cent store and Big Lots under the huge clock in the corner. Social Get-Together are usually scheduled every month or two and have included meeting each other to tour the Mesa Arts Museum, Arizona Museum of Natural History, Target practice at Caswells with a Certified Instructor, Barbecue/Pot Luck Lunch, Bowling, Super Bowl Party, Riding the Light Rail system to downtown Phoenix to see the Science Museum, Coldstone Creamery for ice cream, the Sea Life Aquarium at Arizona Mills Mall, and many, many others! Free Pie at Village Inn Day is a group of our members that live in East Mesa and they meet on the 3rd Wednesday every month at 5:00pm. Some have dinner and then pie and others just come for a beverage and free pie after eating dinner elsewhere. This Village Inn is located on the SE corner of Main Street and Power Road in Mesa. Coffee Clatch in Queen Creek is a group of our members that live in the Queen Creek, San Tan, Gilbert or Chandler area. They meet twice a month on the 2nd and 4th Wednesday every month at 2:00pm at the Paradise Bakery. This is located at 21202 S. Ellsworth Loop Rd. Ste. 100 in Queen Creek. Join in and write your own page! It's easy to do. How? Simply click here to return to Fibromyalgia Support Group Directory.